Awad, General Secretary of the National Evangelical Synod of Syria; Bishop Elias Toumeh, The Orthodox Bishop of Pyrgou-Syria; and Bishop Armash Nalbandian, Primate of the Armenian Church of Damascus. The Religious Freedom Coalition assisted in hosting the clergy during their visit to Washington, but the Westminster Institute was the prime organizer of their visit. There was a closed meeting arranged with Senators that allowed no media or other outside groups. As a result I could not attend the meeting in which Senator John McCain burst into the room and verbally attacked these men of God who came to Capitol Hill asking for help for the persecuted Syrian Christians. So abusive was Senator McCain that another Senator apologized to the clergy for his behavior. I have great admiration for Senator McCain’s service to the nation and his sacrifice as a prisoner of war for many years under horrid conditions in a prison camp in North Vietnam. In the past, McCain used to sometimes work with conservative groups here in promoting religious freedom. For instance, he was the keynote speaker at a dinner promoting religious freedom in the Capitol about ten years ago, and my wife Nancy and I attended and met with the Senator. 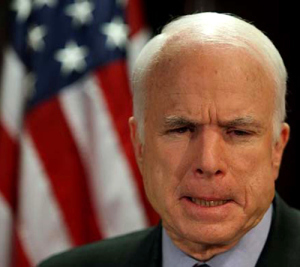 Since he ran for president and lost to Barack Obama in 2008 I have watched with dismay as Senator McCain has grandstanded, often with angry outbursts, on various issues. Last year he flew to Turkey, then entered Syria illegally to promote the civil war against the secular government there, insisting he had found “moderates” to fight Assad. He posed for photographs with the “moderates” who were later identified as terrorists wanted for attacks in Lebanon. Earlier, Senator McCain had pushed Obama to attack Libya directly and was the prime mover in the Senate to support Obama in overthrowing that government. The result of the United States and Europe overthrowing the government of Muammer Gaddafi was the establishment of a terrorist state and the death of several Americans, including our Ambassador. Bottom line: To grandstand and pretend to be president, Senator McCain has gone anywhere that he could be the center of attention, and promoted violent change. “Senator McCain, an Arizona Republican, evidently doesn’t want to hear negative stories about the rebels he’s working to arm. 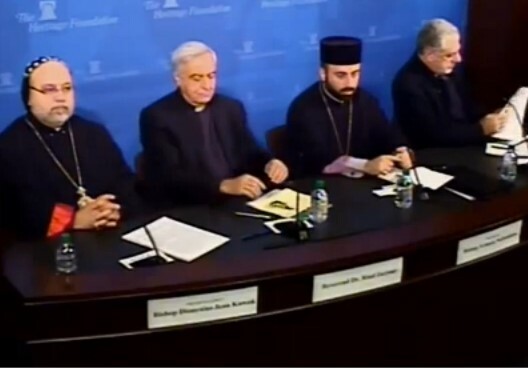 So he stormed out of a closed-door meeting with the Syrian clergy officials last week. Held in the Senate Arms Services Committee meeting room, the reunion also included senators Lindsey Graham of South Carolina, Sheldon Whitehouse of Rhode Island, Richard Blumenthal of Connecticut and Joe Manchin of West Virginia. Graham is a Republican and the rest are Democrats. The Putin Dilemma – Above I mentioned Senator McCain’s incredible trip to Kiev before the mob ousted the elected government of the Ukraine. The Senator actually stood at the barricades outside of the Parliament and encouraged the mob to take over the government. Eventually the ultra-nationalists did force out the elected government, and are now in charge. As for the Ukrainians who overthrew their democratically elected government … maybe conservatives should take a close look at these leaders before patting President Obama on the back for “defeating” Putin and “winning” the Ukraine for America. “The leader of Svoboda (or “Freedom”), Oleh Tyahnybok, is on record saying that Kiev is governed by “a Jewish-Russian mafia” and has said Ukrainians bravely fought Muscovites, Germans, Jews “and other scum” in World War II. This unsavory constituency, including the “ultra” Right Sector movement, manned the barricades in the Kiev uprising, providing “security” to the mainstream political opposition leaders and matching the pro-government forces in violent tactics that led to the dozens of dead in and around the Maidan. A free democratic nation such as the United States should not be in the business of supporting mobs bent on overthrowing the elected leaders of a nation. There are now NO elected leaders in charge at any level in the Ukraine, and both the Dems and the GOP are praising this? Secretary of State John Kerry even went to Kiev to lay flowers at a memorial to mob rule. President Vladimir Putin is cast as an evil villain and blood thirsty madman by the American media, which often points out that he was once head of the old KGB (note that our own President George H.W. Bush once headed the CIA.) Putin actually presided over the dismantling and reform of the old KGB. He may be no Easter bunny, but he is a far better man and a far better human being than the fascist monarchs we support in Qatar and Saudi Arabia. Even while we try to punish Putin, we are arming Islamic nations with sophisticated weapons systems. King Abdullah of Saudi Arabia is an insult to all of humanity, yet Barack Obama bowed to him. Then, with the support of Senator John McCain and other Republicans, Obama has sent two Air Force Groups and naval missile cruisers to the Baltics to threaten Christian Russia. Obama’s warning to Putin is this: “Don’t you dare interfere with the mobs that overthrew the elected government of the Ukraine.” I have seen a lot here in Washington, but this is really nuts. Why do President Obama and the Western media have such hatred for Russia? In Russia the clergy are allowed to enter the schools to give instruction in the Bible. Prayer is allowed in the public schools in Russia as well. It is against the law to sell or give pornographic literature to anyone under the age of 18. Marriage in Russia is allowed only between one man and one woman. Last year President Putin signed a law outlawing advertisements for abortion. In 2011 Russia passed a law requiring health warnings to women before getting an abortion, and now the Duma is considering outlawing abortions completely unless the mother is in immediate danger of death. (In the old Soviet Union, abortion was the primary means of birth control). There is no complicated tax code in Russia; they have the kind of flat tax the Republicans have pushed in the USA for years. In Russia everyone pays the 13% income tax regardless of how much they earn. The year after this flat tax was instituted in 2001, the Russian economy took off like a rocket and tax revenues increased as well. Russia is not a communist country any longer. Russia has as many or maybe even more millionaires than the United States. There is free enterprise; anyone can start a business, and many people do. Now you know why Barack Obama and the liberal media hate Russia so much. Morally and spiritually, Russia today is about what America was in the 1950’s. Christmas for Refugees program moves forward – Since it is many months until Christmas, 2014, I don’t want to dwell too much on our planned Christmas dinners and relief efforts for Christian refugee children, but I do want to report this month on our preparations. I hope to expand the program from the 1,000 children we had last year to 10,000 this year. Rather than plan a few large events in winter as we did last year, it seems it would be better to have many smaller groups of children, in churches all over Jordan and Lebanon. I am also working to hold some of the dinners directly in Christian towns in Syria such as in Jaramana. The support base of the Religious Freedom Coalition is not large enough to finance the entire project. While we could manage 10,000 meals, the biggest cost by far is for the “joy bags” the children take home to their families. Each bag contains food stuffs such as rice, beans, pasta, powdered milk and dates to last for several meals. To finance the project and to bring a better awareness of the dire situation of the refugees, I must reach more people. Over the past thirty years the Religious Freedom Coalition has collected hundreds of thousands of petitions and other contacts. We have huge data bases of social conservatives who currently do not donate to our projects and do not receive newsletters. Beginning this month we will mail a very lengthy letter explaining the plight of Christian families in Syria and what the Christmas for Refugees program will do to help them. In March we will mail 50,000 letters and costs permitting, 50,000 each month through October. In all we will mail 400,000 letters. If projections are correct, we will get about 8,000 financial supporters of the program from these mailings. Most of those who will receive the letters have offered moral support or signed petitions to Congress, but have never actually donated funds. PLEASE … be in prayer that those receiving the letters will be touched by the need and support the Christmas for Refugees program for 2014. Most of those receiving the letters will probably not respond financially, but there is still an upside. Those that do not help financially will still be educated about the persecution of Christians not only in Syria but in the entire Middle East. This is as much an educational project as it is a fund raising project. This month I have a special request. Please help finance these mailings to perspective supporters of the Christmas for Refugees program. The letters will be mailed at a non-profit rate rather than first class and the printing service is giving us special rates. If you help with the mailing costs we can reach more people and add more support for the Christmas project. As part of the Christmas program we have revamped the site at Christmas4Refugees.org and it now has a new video about the program that features the kids we served dinner to our first year of the program, I hope you will take the time to visit the site.